We are all familiar with gardens and other manmade landscapes, but many people do not have the knowledge to fully understand how to create the different components of these different landscapes. As well as choosing appropriate plants to meet the local climate and soil conditions landscaping is concerned with design and construction. Take this course to find out about recording pre-planning information on site, how some different garden styles are created, how to make landscape drawings, what goes into making walls and hard landscape surfaces, how to add garden features to designs, how to make small spaces seem larger, lending from the surrounding landscape, and how to design small and large landscapes. ACS student comment: "[The course] gave me an insight into a subject that I have been interested in for a long time. Plus it has helped me in my current job with a local landscape/nursery company. [The structure] was done in a way which was very easy to understand and this helped when you hit a subject which was hard to get a grip with. All feedback from the tutors was very constructive and helpful. David Painter, UK, Landscaping 1 course. Create visual effects through the use of different landscape design concepts. Determine pre-planning information required to prepare a landscape design. Determine an appropriate garden style for a landscape, to satisfy specifications for a design project. Illustrate a landscape design through a plan, using legible graphic skills. Determine different hard landscape features, including earthworks, surface treatments and furniture, to incorporate in a landscape. 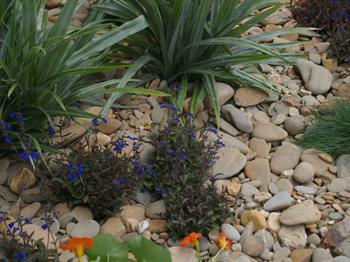 Prepare planting designs for different landscapes. Landscape Design is a multifaceted skill. It allows you to take a vision or "feeling" and transform it into a workable plan. It isn't just making a place look nice, nor mass planting, but is also about suiting the landscape to the climate, land and setting that you have to work with. An understanding of plants, soils, timbers, climate, and other landscape materials are pivotal to the success of a good landscape design. -Explain the complete range of principles, elements and concepts used in landscape design. -Visit and analyse a broad range of landscape styles, themes and components. -Perform methods utilised to develop concepts and to create affects. -Identify, record and utilise pre-planning information for the purpose of design development, and to use a checklist as a guide for surveying a site for a proposed design. -Perform site survey and client interview with the site owner/manager. -Explain the significance of effective client liaison, in a specific landscape job. -Identify historical influences on landscaping in your locality. have been prominent in world garden history. -Develop and compare the appropriateness of three design options for one specific landscape project. -Draw an extensive range of different landscape symbols on paper, covering soft and hard landscape features. -Transpose two different landscape drawings, reducing the scale by a specified amount. -Draw a plan for a landscape, using legible graphic techniques. -Explain the legal requirements for cleaning up after a job in your locality. -Determine suitable timbers for construction of four different types of garden structures. *Asphalt *Concrete *Local gravels *Local mulches *Timber *Ceramics. -Collect, catalogue and determine appropriate use for different items of garden furniture. -Design a paved area for a garden surveyed, including: scale drawings and construction instructions. *How to use each of these plants in different landscape situations uses. -Develop detailed planting designs, including plant lists, for three landscape plans, to satisfy given job specifications. -Analyse and compare the landscape designs of numerous selected homes and public parks. -Draft a series of four conceptual plans, showing stages in the design of a surveyed home garden. 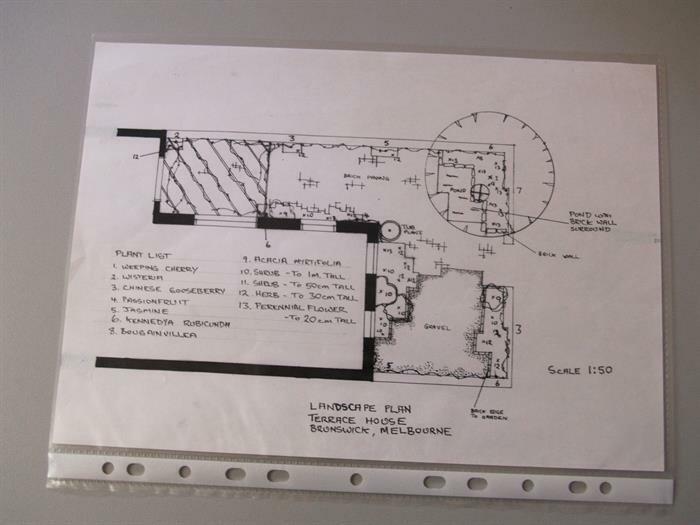 *A landscape plan drawn on tracing paper. *Materials specifications, including types and quantities. This course is a solid introduction to landscaping. It serves as an ideal foundation for people wishing to work in landscaping. It will not lead to a construction license but should provide basic skills needed to undertake small scale landscaping projects which do not require council approval. It could also add to the skillset of people wanting to start a landscape business, or be of value to people wishing to renovate a home garden.